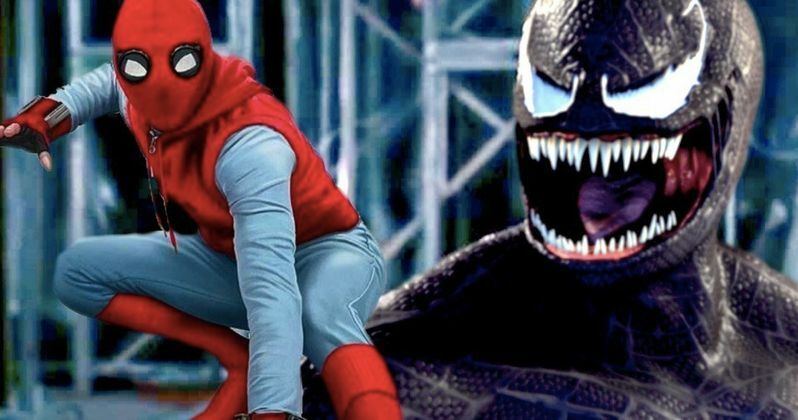 Tom Holland's Spider-Man to Appear in Venom After All? Don't get too excited just yet, Marvel fans, but it looks like we could be seeing Tom Holland as Spider-Man show up in Sony's upcoming Venom movie after all. Early on in the process, we heard that Sony wanted this Spider-Man spin-off universe to connect to the MCU. Specifically, they want the new Spider-Man to be a part of the universe. While that has been shot down by Kevin Feige and others since, a new rumor suggests Sony may have worked it all out. During the latest episode of Collider Movie Talk, co-host Jon Schnepp revealed that he's heard from an unnamed source that Spider-Man is indeed going to appear in Venom, which stars Tom Hardy as Eddie Brock. He couldn't reveal much else about the alleged appearance, but if this holds true, it sounds like Venom will, in some way, be connected, even if only loosely, to the MCU. Here's what Schnepp had to say about it. "Spider-Man is going to be in Venom. For the last couple of months, we've been hearing how Sony is keeping it all separated, and Spider-Man is in the Marvel Cinematic Universe, but every other character that's in the Spider-Man universe is separate. All I'm saying is that Spider-Man, and I'm talking about Tom Holland's Spider-Man, is going to be in Venom." On the one hand, fans of the Spider-Man comics know that Venom is very much connected to Peter Parker. So the idea of doing a Venom movie that wouldn't be connected to Marvel's webslinger in any way was a tough pill to swallow for many. On the other hand, Venom is going to be R-rated and isn't being made by anyone involved with the MCU. Having Tom Holland appear in such a movie could complicate things. Sony's Amy Pascal, while sitting right next to Kevin Feige, had this to say about this Venom movie in regards to its relationship to the current Spider-Man movies. Since then, Kevin Feige, Amy Pascal and Tom Holland have all said Spidey won't be in Venom. Jon Schnepp also said that "He's definitely not a central part of the plot," when talking about Holland's possible role in Venom. When pressed about Holland's role, being asked if it's more of a cameo or something a bit more significant, Schnepp merely said, "I can't answer that question at this time." We won't have to wait long to see if this interesting rumor turns out to be true, as Venom is scheduled to arrive in theaters on October 5. You can check out the talk of Spider-Man's rumored appearance, via the ColliderVideos YouTube channel, for yourself below.